First up for the day were our Men’s footballers. 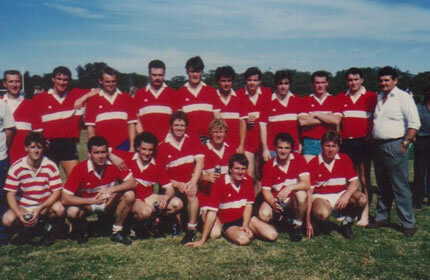 They faced a determined Bondi Gaels side and came away with a 3 point victory on a scoreline of 1-13 to 1-10. Our lads controlled the game for large parts but couldn’t make it count on the scoreboard. However they’ll be happy to get the win on the board going into the Easter break. Next up were our ladies who came up against a Central Coast side who were undefeated in the league coming into today’s game. Coast started the strongest and led by 3 points at half time but our girls worked hard in the second half and came away with a draw. Final score was Cusacks 2-10 Coast 3-7. Both sides will feel they could have won it but a draw was probably the fairest result with each team keeping their undefeated record for 2019 intact. Our Camogs were up straight after the ladies football also against Central Coast. Coast started off the strongest and had built up a convincing lead at half time. Our girls dominated the second half but could not find that all important goal they needed and went down on a score line of 2-10 to 0-12. Last up were our Hurlers who were back in action after having no game last weekend. They faced Craobh Phadraig and controlled the game from start to finish and came away with a convincing victory on a scoreline of 2-18 to 0-11. Our B footballers were given the points by Bondi who were missing players and unable to field. Well done to all our players today! We recently said goodbye to one of our longest serving Cusacks - Padraig O Reilly better known as Podge. Podge arrived back in February 2005 and after 14 years with the club has returned back to his home club, Clonguish, Co Longford. Podge was hugely involved in the club both on and off the field; referring men’s football for several years-both in Auburn and Ingleburn, as well as always putting his hand up to help with events – lining the pitch for our own All Sydney GAA tournament was always one of his favourite jobs! He also part trained and managed the men’s footballer in 2006-2007 all amidst of also playing. Podges commitment was recognised back in 2010 where he was awarded with a framed jersey for playing over 100 games with the club at the dinner dance. He was also vice-captain for a NSW compromise rules teams that played the Aussies, and then also played for NSW against the Ireland team in 2008 in a lead up to the International Rules Series. All the best at home podge! Always had a cheeky grin on the face. So long Padraig safe travels back home. All the best Podge. Forever thankful to you the Monday after Paddy’s Day 2011 for warning me the foreman was looking for me, while I was lying sleeping behind a pile of doors 🙌🏼 best of luck for the future! Fuking some great and wild times with ya bud! Lost memory of a few because I was that wasted but the times I do remember were magic!!! I think Ganley only kept me about cause you wouldn’t turn up on a Monday, so I thank you for that! Best of luck back home mate. Best of luck back home. Great Cusacks player but even better bloke. Myself and nugget will call up for a pint in July. Well done Podge boy! Not a bad effort for a boy from Longford! 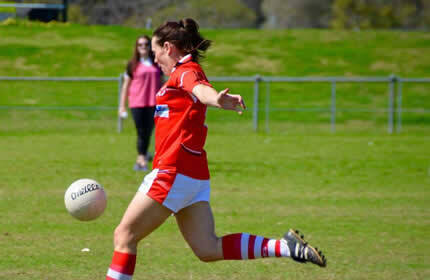 Our ladies footballers were next up against Penrith Gaels GAC. In what was a one sided game our girls kept their 100% record intact with a comprehensive victory. Lastly was the turn of our B footballers, they played a strong Cormac McAnallens team who were very clinical on the day. Our lads workrate could not be faulted be Macs had too much firepower and came away with the win. Our hurlers had a bye this weekend. Michael Cusacks GAA Sydney shared a post. NSW GAA Youth Development program will be beginning this Sunday 7th April at 11.00am. Registration opens at 10.30am for all parents. We want to give parents with young children the opportunity to learn and achieve a basic knowledge of Gaelic Games which the children can then develop over the period of the program. The program allows boys and girls, between the ages of 4 - 15 the benefit of an action packed fun-filled session of activities with a strong emphasis placed on skill acquisition of both Football and Hurling. The program takes place at alongside our league games which are held at Monarch Oval, Fields Road, Macquarie Fields NSW 2565.